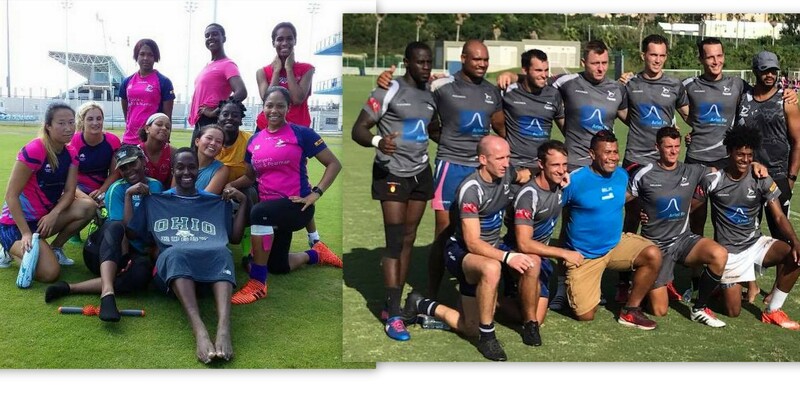 The Bermuda	Rugby Football Union have named	the National Men’s	and	Women’s	7s	teams	who	will	represent Bermuda	in	the	Rugby America	North 7s Tournament in Barbados	this	weekend. The	Men’s team who placed	6th	overall last year will face tough opposition in their pool play against Mexico, Turks and Caicos Islands	and	Guadeloupe. The	team will	once again be	led	by	Fijian	Rugby 7s legend Waisale Serevi, who	has	coached	them through	RAN 7s for the	past	several years. A	mix	of	experience	and	skill	in	Barbados	will represent Bermuda	as	4	members	of	the	team make their	senior	international	debuts. Captained	by Tashon	Desilva, Bermuda	will	see	Corey	Boyce,	Aldo Campbell,	Dan	Cole,	Alex	Doyling,	Tom	Healy, Bertie Horsefield,	and	Neville	Zuill	returning	to	the tournament. Tadhg O’Shaughnessy,	Stephan	Smit,	Alex Brown	and	Jamie	Baum	will	all	receive	their	first International	caps	when	they	take	the	field	in Barbados. After a	tough	tournament	last	year,	the	Women’s team are	looking	to	improve	upon	their	result	with the	help	of	new	coaching	staff, Jamie	Barnwell	and Keith	Hodgkins. Pool	play	will	see	the	women	face	off against	Jamaica,	Trinidad	and	Tobago,	Bahamas	and Curacao. The	squad	will	look	to	their	experienced	players	to make	a	statement	on	the	pitch, while	two youth	players	will	make	their	international	debut. The	squad	will	feature	returning	player	Gillian Cross (captain),	Mika	Tomita,	Deneka	Borden, Amanda Swan, Karly	Alleyne,	Lauren	Rothwell,	Corrie	Cross, Cerise Woodley	and	Lysmeiri	Santana	Suazo. Youth	players Keonte While	and	Camille	Chin-Gurret have	both represented	Bermuda	on	a	youth	international	tour, and	will	make their	first	senior	appearance	in Barbados. Of	the	upcoming	tournament,	coach Barnwell remarked, “The	RAN	7’s	competition,	periodically serves as	the	regional	qualifying	competition	for	the	Rugby World	Cup	Sevens	and	Olympic	Sevens. Whilst qualifications	for	these tournaments	are	perhaps objectives for	the	future	the	current	playing	squad	is comprised	of	quality	people	who	have	worked incredibly	hard	in	light	of	many setbacks. Those of us who	are	inspired	to	believe	that	‘good	people beget	good things’	may	see	this	as	the	reason	why the	Bermuda	Women’s	Rugby	Team	have	enjoyed some success	in	their	recent	warm-up	preparations. As	part of	their	preparations	the	team	played	twice against the	U19	Bermuda	Men’s	team	last	week. They performed	well	in	both	games	managing	to	win	the first	encounter	and	narrowly	lose	by	four	tries	to three in	the	second	game. The	reality	is	that	we	all	need	to	be	inspired	and	motivated	and	many of the	stories	of	these	women	will	do	just	that”.